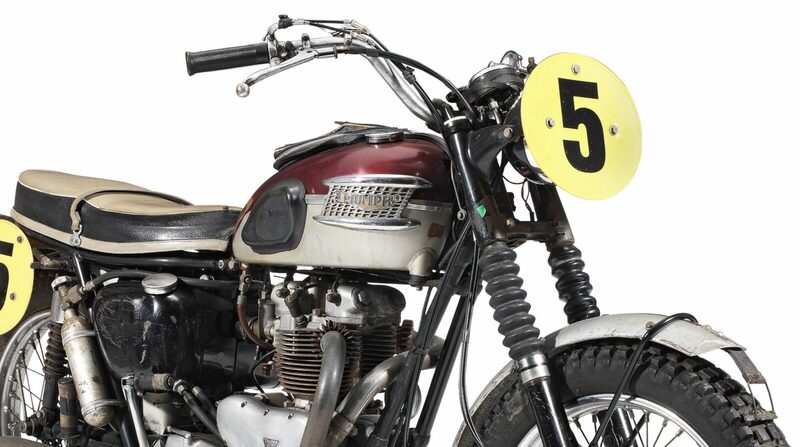 This is the Triumph TR6SS Trophy that Bud Ekins rode to a Gold Medal-win in the 1962 International Six Day Trials in Europe while he was there with Steve McQueen acting as his stunt double for The Great Escape – including that iconic barbed wire motorcycle jump scene. 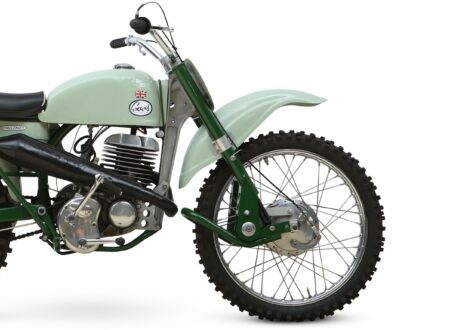 Bud Ekins is famous in motorcycle circles as one of the greatest off-road racing riders of all time. As a young man he bought a 1940 Triumph and rode it all over the hills around his family’s Hollywood Hills home, becoming quite adept at piloting it at speed over uneven terrain. 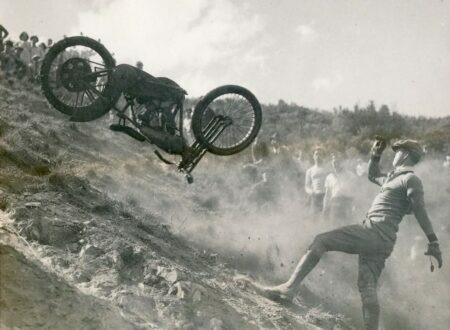 These skills would stand him in good stead as he moved up the local off-road scrambling scene and onto the international stage. 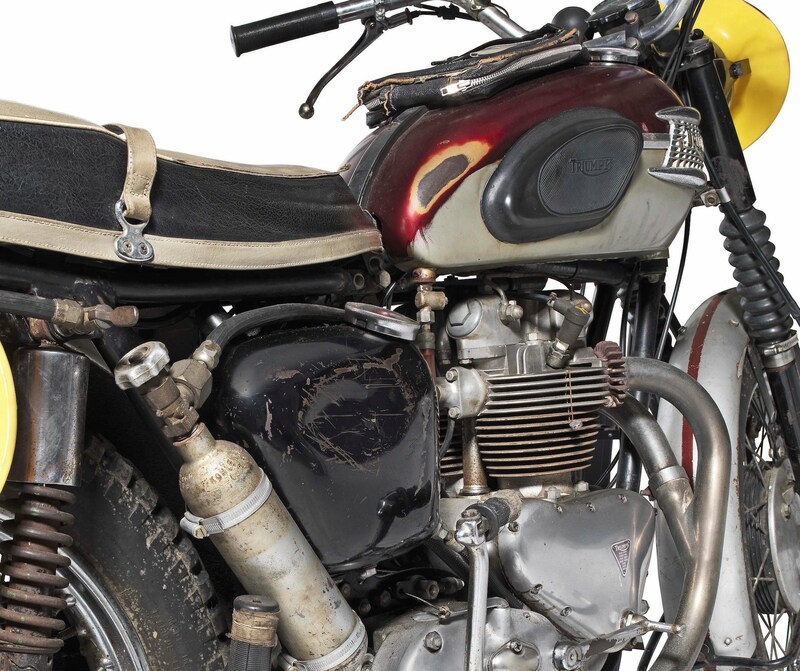 Over the course of his career he would win almost every major off-road motorcycle race in the world, he became one of the most popular stuntmen in Hollywood, he became person friends with Steve McQueen, Paul Newman, and Clint Eastwood, he built up the most valuable motorcycle collection in the United States, and he rode the entire length of Mexico’s Baja California Peninsula in 39 hours and 48 minutes to set a new Tijuana-to-La Paz record. 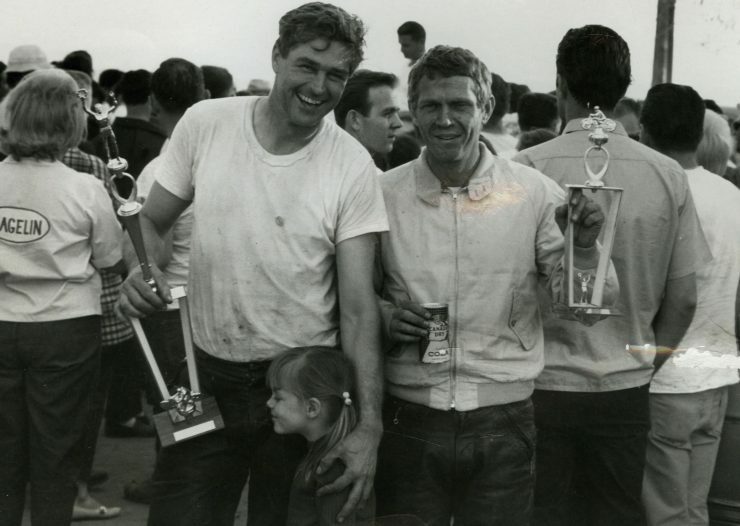 This Baja speed-run would be the seed that would grow into the modern Baja 1000, and if you’ve ever seen the movies The Great Escape, Bullitt, Diamonds Are Forever, The Towering Inferno, or any of the dozens of other films Ekins performed stunt duties in, you’ve already seen him at work. 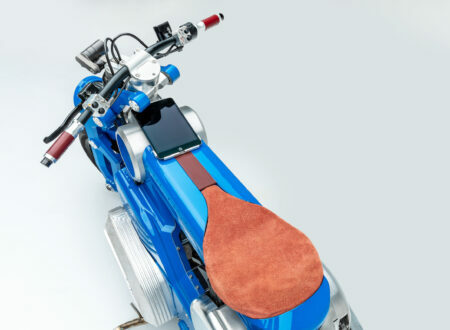 If a motorcyclist has ever existed who was cooler than Ekins, I’m yet to hear about them. 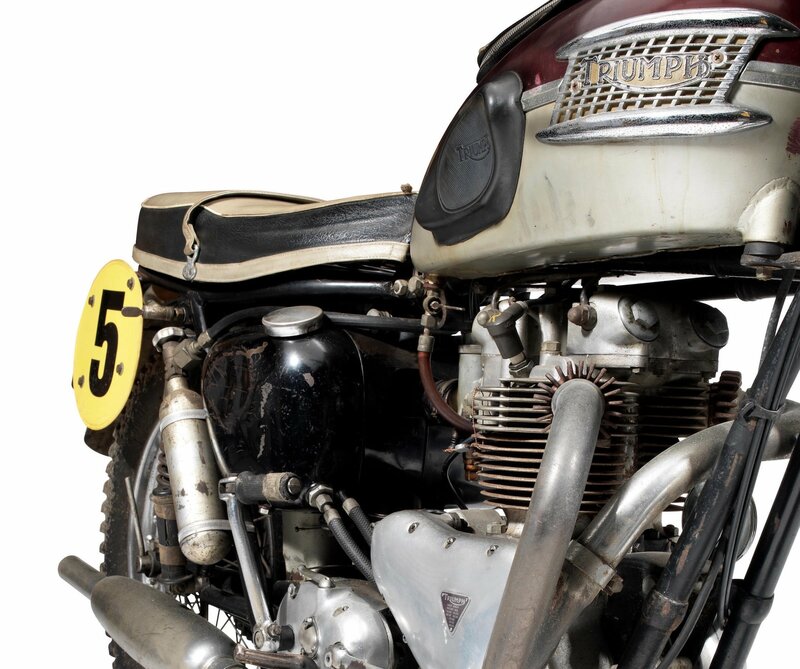 The Triumph TR6 Trophy was developed by the Brits specifically for the Americans, particularly the Californians who had developed a love for racing motorcycles across the desert. 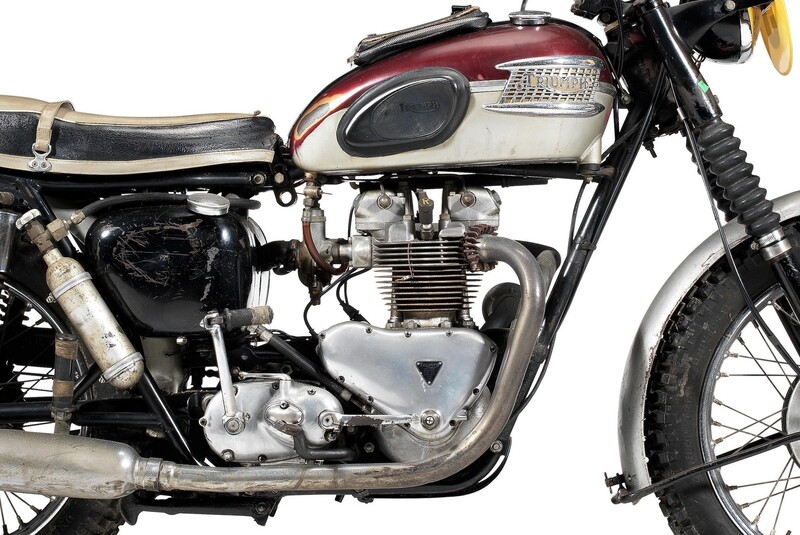 The TR6 became known as the “desert sled“, and it became an almost de facto choice for off road motorcycle racers from the mid-1950s well into the 1960s. 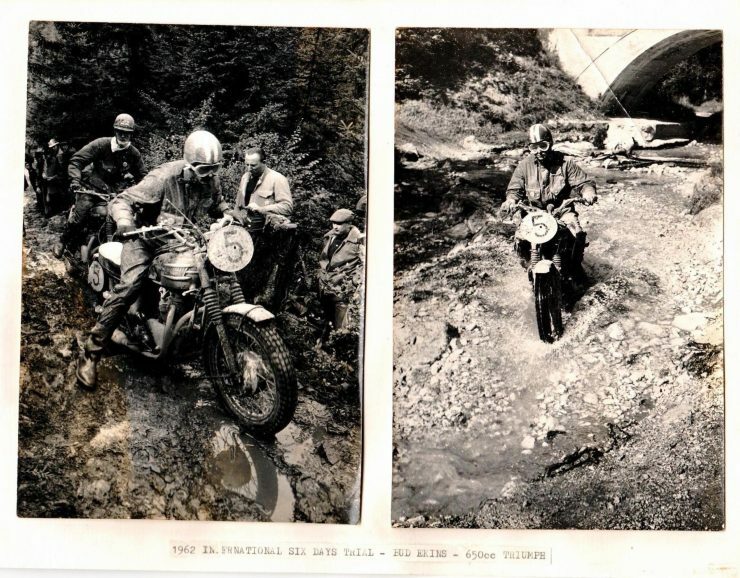 There were other scramblers of course, many of them British, but it’s hard to argue that the TR6 wasn’t the king of the hill. 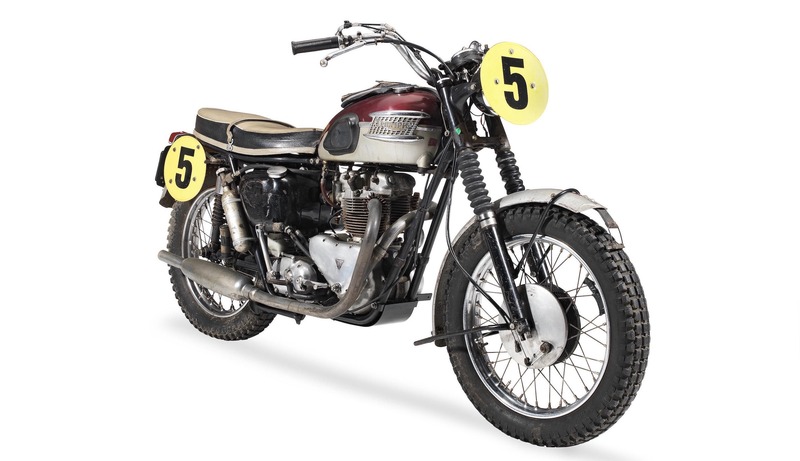 Off-road racing was nothing new in the 1950s when the Triumph TR6 first appeared, but motorcycles that were designed from scratch for off-road use were still relatively uncommon. 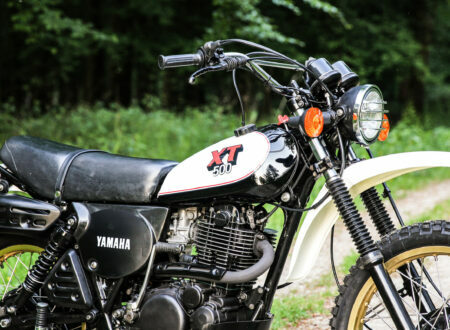 Instead, many motorcycle manufacturers created “scrambles” versions of their road bikes, with thickly padded seats, knobbly tires, raised exhaust pipes, wide handlebars, and fenders designed to tame the mud, dust, and puddles. Much like Bud Ekin, the TR6 won just about everything including multiple wins in the Big Bear Run, the Catalina Grand Prix, the International Six Days Trial (ISDT), the California State Hare and Hound Championship, the Barstow to Vegas 150 mile (240 km) desert race, the Greenhorn Enduro, and many more. The recipe for success used by the Triumph was little more than an air-cooled OHV parallel twin, a single Amal carburettor, a 4-speed transmission, twin rear shock absorbers, and traditional forks up front. 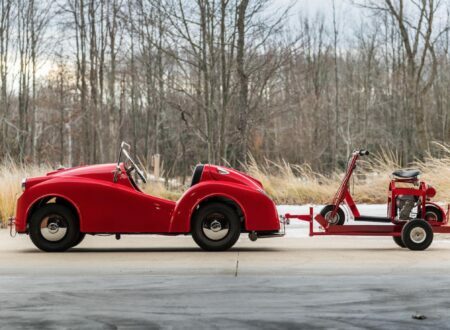 Power varied between sub-models between 34 and 46 bhp, and the bike weighed in at 365 lbs or 166 kgs when dry. 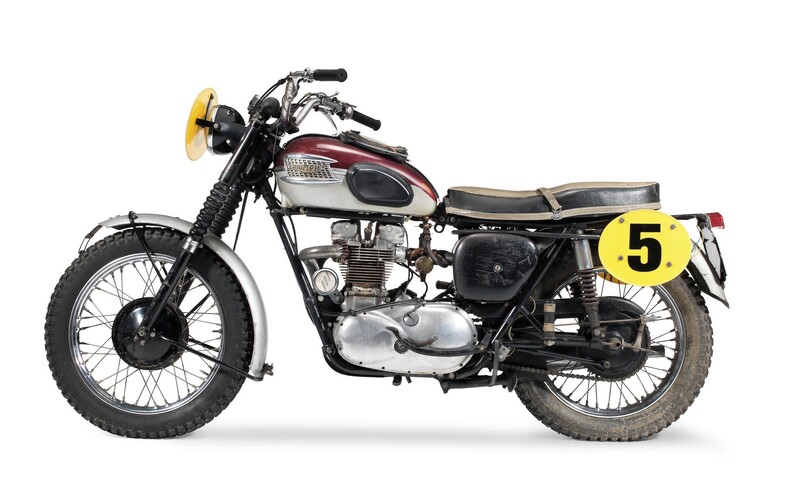 Fortunately the popularity of the TR6 meant that Triumph sold a lot of them, and it’s still possible to find good examples for sale secondhand in most western countries for reasonable asking prices. 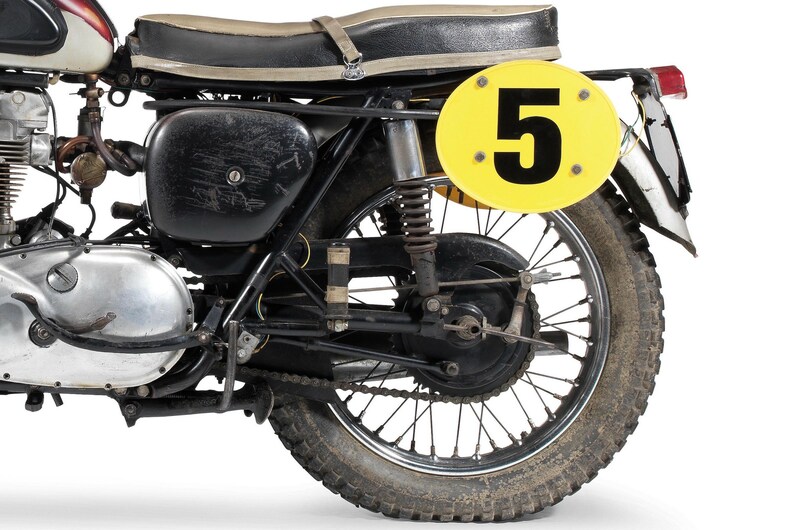 The TR6 you see here is doubtless one of the most special in the world, it was piloted by Bud Ekins to a popular Unlimited Capacity Class and Gold Medal win at the 1962 International Six Days Trial while he was in Europe filming The Great Escape. 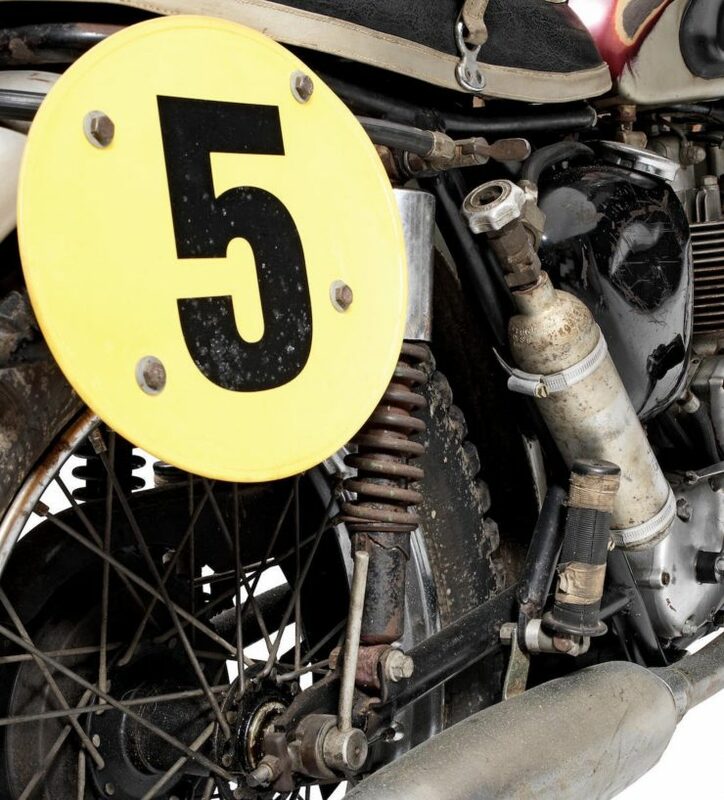 He kept the bike for years after his win, road-registering it in the US and keeping it in his collection. 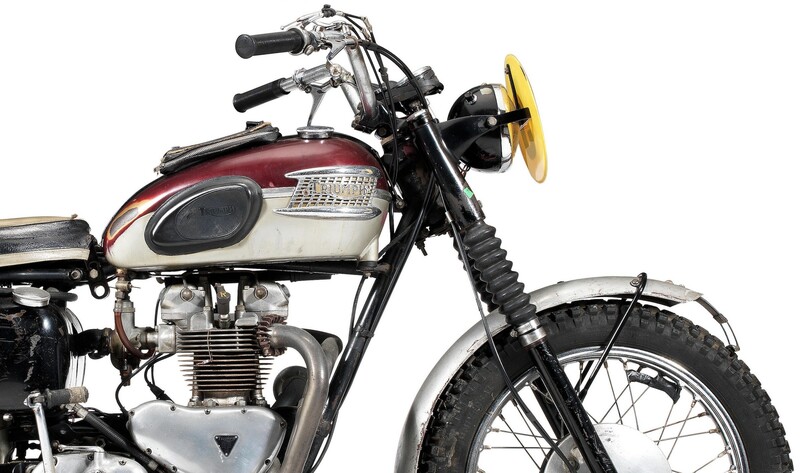 Many years later Bob Gardiner began assembling his collection of historic ISDT motorcycles, and he was provided the opportunity to buy the 1962 Bud Ekin’s Triumph through famed frame builder Eric Cheney who was selling some of Bud’s bikes in the UK. 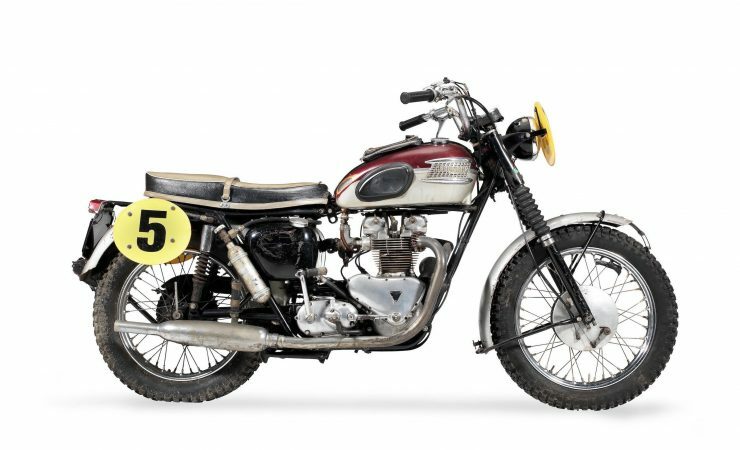 As part of a collection for almost its entire existence the TR6SS remains un-restored and virtually 100% original, as it was in 1962. 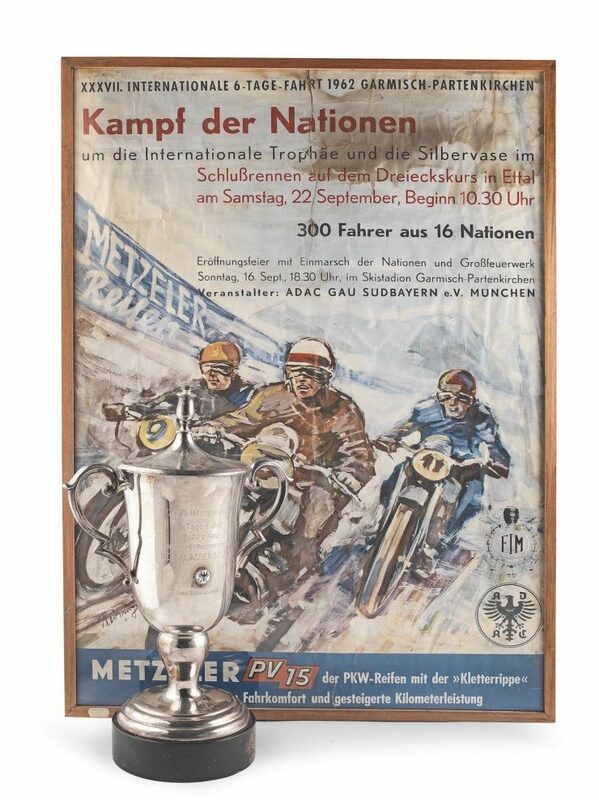 It has just 4,478 miles from new and it comes with a framed 1962 ISDT poster and the cup awarded to Bud Ekins for his individual class win. 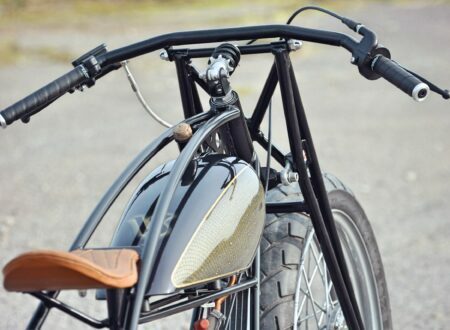 Bonhams will be offering the bike on the 27th of April, if you’d like to read more about it or register to bid you can click here to visit the listing.